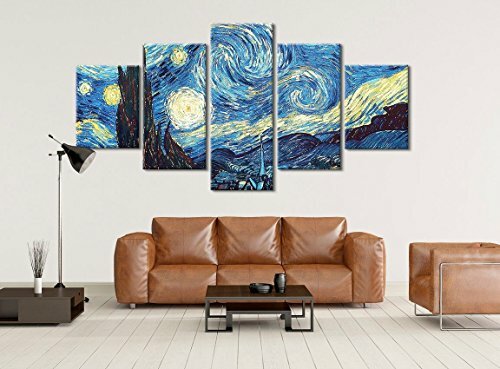 Extraordinary Van Gogh Oil Paintings Starry Night Canvas! You deserve something bigger and better than the average designs around, these are exclusively sold here. Perfect addition to any room or office space, Ships in 3-5 Business days! Imagine prints with amazing color fidelity for the most demanding. We use high quality canvas and Ink, combining extreme print quality and high print speeds in production canvas wall decor for your home & office. eThis gallery wrapped canvas is stretched on durable pinewood framework with 1,5" (4cm) depth. We delivery this product ready to hang, no additional framing required. If you want order custom size you can send us a message, we will check it and give you an answer. CHOOSE YOUR SIZE: 1 Panel or 3-4-5 Panels Canvas Set Width x Height Sizes are shown all set combined GENERAL INFO ABOUT OUR PRODUCTS: 350 gr/m2 High Quality 100% Cotton Canvas Our prints guarantees 100 years indoors Waterproof 1,5" (4 cm) thick wood frame HANDLING & SHIPPING INFO: After printing and stretching canvas on wood framework, we will carefully pack your product. Canvas are shipped in strong cardboard box. Items generally ship within 1-3 business days from date of completed payment. Please understand that we have no influence on delays caused by customs. If you have any questions about this product by Canvas kings, contact us by completing and submitting the form below. If you are looking for a specif part number, please include it with your message.